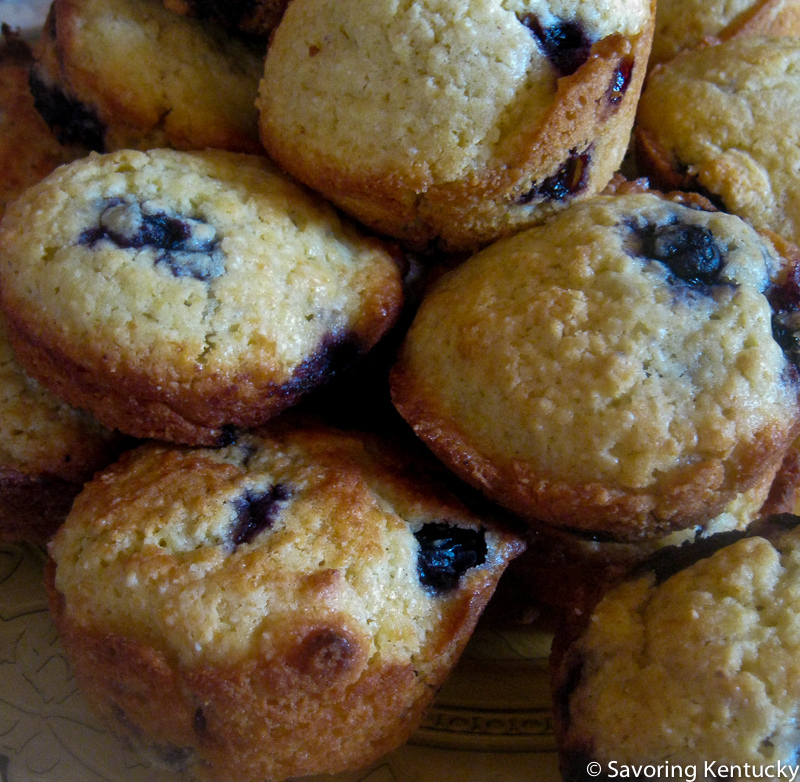 In the spring of 2012, as the Cornbread Supper hosts noticed how many wonderful local foods from 2011 rested in freezers, still waiting for their time to shine, a multi-week series of Blueberry Corn Muffins came about. For about four weeks in a row, sweet, tender pastries with a little bit of crunch on the edge and big blueberry spots in the middle graced the Cornbread Supper table. It turned out that some Cornbreadians under the age of six developed an affection for the muffins beyond their usual enjoyment of the cornbreads of the week. And people above the age of six asked for the recipe, more than once. It is below. But first, a bit more chatter. The goodness of the muffins comes from two sources. First, Steve Kay's sister-in-law Janice Kay is a fine cook. Janice has professional catering credentials in addition to formal training in nutrition. She teaches people how to cook, with a particular focus on healthy food. The basic batter comes from Janice Kay's Corn Muffin recipe. The muffin's tenderness comes from just the right blend of ingredients, including plenty of butter, and its delicate sweetness comes from just the right, tiny amount of sugar (1/4 cup per 12 muffins). Also, as with all muffins that contain flour, savvy cooks stir the batter only the bare minimum of turns—even leaving a few streaks of flour unincorporated—so the gluten in the flour will not toughen the baked muffin. The second source of goodness? Reed Valley Orchard blueberries, frozen at their peak in 2011. They are plump, sweet and juicy. Rona uses about 2/3 cup frozen berries, straight from the freezer, in a single recipe of the muffins. Rona doubles and triples this recipe with no problem. Although the original recipe is for eight muffins, with young eaters in mind, Rona divides one recipe among 12 muffin cups, yielding mid-size muffins. For Cornbread Supper, Rona typically makes a triple recipe of batter, adds a pint of frozen blueberries (not thawed), yielding a total of 36 right-sized muffins. One more shortcut: since preparation for Cornbread Supper always runs in a tight timeframe, Rona adds the melted butter to the milk/egg mixture, beats for a minute or so with a rotary beater, and dumps all the liquid into the dry ingredients at the same time. Sift together dry ingredients. Beat together eggs and milk. Add flour to milk alternately with butter. Spoon into 8 greased & floured 2 ½-inch muffin tins. Bake @350 degrees 15 minutes. As weeks go by and we keep making these fantastic muffins (a triple recipe each week), we've also experimented with gluten free flours, and think the muffins have an even better texture when using the lighter GF flours. We have tried several blends, and (in September, 2012) we favor Bloomfield Farm's All Purpose Baking Mix. Here's the tweaked recipe. Mix together dry ingredients. Beat together eggs, milk, melted butter, and vanilla. Add wet ingredients to dry, and stir lightly. Just before the ingredients are fully mixed, add the berries, and stir just to combine. Spoon into 8 greased & floured 2 ½-inch muffin tins. For smaller, slightly crispier muffins, divide into 12 muffins. UPDATED AGAIN: Two dozen gluten-free muffins at a time, in one bowl! Spray two 12-muffin tins with Baker's Joy or grease them well with coconut oil or clarified butter. Beat the liquids with a rotary beater or whisk until well blended. Nicely yellow! Set the bowl of liquid on a digital scale. Leaving the bowl on the scale, push the button or function that yields zero again. Add 5.75 ounces cornmeal. Reset to zero. Add 14 ounces Gluten Free Flour (Bloomfield's preferably; do not use a mix that includes leaveners like soda and baking powder). Reset to zero. Add 4 teaspoons baking powder. Add 3/4 teaspoon fine sea salt. Remove from scale. Mix the dry and wet ingredients together until just a little unmixed flour remains. Add a rounded 2 cups of frozen or fresh blueberries. If using the scale, add 9 ounces blueberries. Mix together gently until blueberries are distributed through the dough. Divide dough among the 24 muffin spots. Bake at 360 degrees for 20 minutes or until lightly browned.